Tidal arrays are like the younger sibling of windmills—a bit smaller and slower spinning than their wind-loving brethren. But unlike windmills, they operate under many feet of water, spinning in the predictable movement of the ocean’s tides. Over the course of the last decade, a handful of companies have taken individual tidal turbines for a successful spin. But the next wave of tidal energy is about to break. Recently, the UK-based tidal energy company MeyGen unveiled its plans for the world’s first multi-turbine tidal energy field. The company is starting with a test of four turbines that will soon be deployed in the churning waters of the Inner Sound in Pentland Firth, Scotland. If the test goes swimmingly, they plan to deploy well over a hundred more over the next decade that would generate up to 398 megawatts of electricity—powering roughly 175,000 homes in Scotland. One of the four turbines comes from Atlantis, a tidal power technology company headquartered in Edinburgh, Scotland, and the three others were developed by Glasgow-based Andritz Hydro Hammerfest. The devices stand some 85 feet tall, about the height of a five story house, and sport three blades that spin with a diameter spanning nearly 60 feet. While smaller than windmills, the turbines are still quite heavy, each weighing in at 65 tons—roughly the same as six African bush elephants. The array will likely hit the water this October, says Cameron Smith, project development director of Atlantis Resources. The turbines have already been shipped to the site and undergone testing on shore. “All we need now is an appropriate tidal window and weather window and we’ll be installing,” he says. Engineers assemble the turbine bases on land, and then, with a crane, lift them from a barge and lower them to the sea floor. Once submerged, each will have at least 26 feet of clearance at the lowest tides. Tidal turbines have many advantages over other renewables, explains Andreas Uihlein, scientific project officer at the European Commission. First, the turbines are submerged underwater, completely out of sight. Though some people revel in the beauty of solar or windmill farms, many consider them eyesores. The Block Island offshore windmill farm, the first of its kind in the United States, met largely broad appeal when it was installed this summer, because of its small size and promise to replace the island’s diesel generators. But the distaste for wind farms was abundantly clear with the uproar surrounding the 130-turbine Cape Wind project off of Martha’s Vineyard. So the positioning of the giant turbines well below the cresting waves is considered a plus. The tidal turbines also generate a predictable supply of power. Unlike wind or solar that rely on the whims of the weather, researchers can actually calculate the tidal pull and the amount of energy these systems will generate. Though the power isn’t a constant supply, ebbing and flowing through the day, its predictability lessens the need to store large energy reserves. The systems will also help with local employment. “There’s the potential to generate 5,300 full-time equivalent jobs over the next three or four years,” says Smith. “I’m hugely proud that 43 percent of this first phase was manufactured using local supply chain.” Many of these new jobs require the same skills as the oil and gas industry, which means that this fledgling industry provides a new home for talented labor. Pentland Firth’s Inner Sound and the individually deployed turbines have undergone extensive monitoring, showing few environmental impacts. Noise levels for turbines already churning away are well below a level that would cause damage, according to MeyGen’s environmental impact analysis. The biggest concern would be collisions with the marine mammals—particularly the harbor seal, whose populations have plummeted in recent years. But no collisions have yet been observed for the single turbine installations, according to a recent report from Annex IV, the body established by the International Energy Association Ocean Energy Systems to examine the environmental impacts of marine renewable energy. That is because, of course, the story doesn’t end there. “There’s always trade offs in energy generation. You could take every one of those statements and put an asterisk next to it,” says Brian Polagye, co-director of the Northwest National Marine Renewable Energy Center, a collaboration between the University of Washington, Oregon State University and the University of Alaska Fairbanks with the goal of advancing the commercialization of marine energy technology. Though initial tests showed no environmental impact, even minor influences will become magnified as the company increases the number of turbines in the field. And, as the Annex IV report notes, most of the research has been focused on measuring the amount of noise the turbines generate, but few have identified how this level of noise could actually affect the behavior of marine animals. Though the noise levels are low, the sound could still interfere with animal communication, navigation or detection of prey. There is also much still unknown about the durability of the turbines. Their placement underwater keeps them out of sight, but the corrosive marine environment could slowly eat away at the devices. They also suffer constant mechanical stress, buffeted about in the currents. Though many companies have deployed individual units, none have been in the ocean for very long. Marine Current Turbines installed the first tidal turbine in Northern Ireland’s Strangford Lough in 2008. Now in its eighth year, this 1.2 MW spinner, composed of two separate turbines attached to a center platform, has been feeding the grid since its installation. “The big challenge for almost every company is going to be, how are you going to do this at a cost that competes with other sources of energy?” says Polagye. As a new industry, tidal energy has had its fair share of setbacks, with several companies, including the Ireland-based Wavebob Ltd., folding after failing to secure funding. But with improved designs, MeyGen and others are spinning their way back up to the top. Their long-term success relies in part on the government support for development and installation, explains Polagye. The United Kingdom government works on what’s known as “market-pull mechanisms,” explains Polagye. In this system, the government pays the difference between the cost of the renewable energy and that of standard electricity. This system pulls the new companies into the market, allowing them to compete with the big dogs of energy. The United States government, however, uses push mechanisms, supplying grants for development but little help competing with other energy sources. In order for these systems to have a future in the U.S. market, says Polagye, the government needs to develop similar pull mechanisms for energy. Though tidal currents aren’t strong enough along every coast to host one of these spinners, there are still many spots around the world with potential. In order for a site to be worthwhile, they must have some type of geographic restriction, like straits and fjords. This narrowing of the flowpath increases the speed of the water movement in the retreating or advancing tides, and therefore increases the energy recovered from the site. “If you look at a map of the world and show all the [potential turbine] sites to scale, they’d look really tiny—you probably would have trouble seeing them,” says Polagye. “But if you were to aggregate them all together, you’d probably end up with a few hundred gigawatts of energy.” And though the world will likely never run completely on tidal energy, a few hundred gigawatts is nothing to shake your iPhone at. To put that amount in perspective, since 400 MW is expected to power 175,000 homes, one gigawatt could power roughly 500,000 homes. A 2015 report from the European Commission’s Joint Research Center suggests that by 2018, there will be about 40 MW of tidal and 26 MW of wave energy undergoing installation. While tidal energy takes advantage of the tides, wave energy harnesses the energy from churning waves. Still in its early days of development, researchers are exploring different ways to do this—from long floating structures that “ride” the waves to massive bobbing buoys. Though wave energy lags behind tidal, according to the report, it has a global potential 30 times that of tidal energy, due to the large number of potential sites for deployment around the globe. Where the field of tidal turbines will go in the next couple decades is a bit of a mystery. When a magnitude 5.5 earthquake roiled El Reno, Oklahoma, on April 9, 1952, workers paused in shock to see their cash registers jittering, desks quivering and typewriters swaying. Then they evacuated in a state of panic. Though only one person was injured in the temblor, the event was rare and troubling. But when an earthquake that clocked in at magnitude 5.8 roiled Oklahoma on Sept. 3, sending tremors to neighboring states and cracking old buildings near its epicenter, it came as no surprise. These days, earthquakes are a routine part of life in the seismically active state. Since 2009, it’s become an unlikely earthquake hotspot, experiencing more magnitude 3.0 and higher quakes than California in both 2014 and 2015. But why? Jeremy Boak, who directs the Oklahoma Geological Survey, thinks he has the answer—oil and gas extraction in the state. The phenomenon is called “induced seismicity,” and it’s become a buzzword in a state that depends on oil and gas for much of its revenue (approximately one in four Oklahomans works in oil and gas.) But oil extraction in the state leads to something else: wastewater that is disposed of deep in the ground and may be the source of the recent quake swarm. Oklahoma has always been seismically active. The OGS has recorded quakes since 1882, but they definitely weren’t the region’s first. Boak explains that a paleoearthquake of at least a magnitude 7 is thought to have occurred about 1,300 years ago—one of many in the region, which lies in the New Madrid Fault Zone. It’s the eastern United States’ most active seismic area, but unlike faults like, say, the San Andreas Fault, the faults are tucked beneath hundreds of feet of soft layers of river soils. Bigger quakes can shake the New Madrid, as in 1811 when a Missouri quake set off mass chaos in the area. But the 1952 quake was one of just a few larger temblors. In fact, by 1962, only 59 Oklahoma earthquakes total had ever been recorded. Though the word “fracking” might cross your mind when you hear about human-induced quakes, the practice doesn’t seem to be linked to the majority of the manmade quakes in Oklahoma. Hydraulic fracturing pumps a controversial cocktail of water and chemicals into geologic formations to crack the shale rock deep inside the earth, yielding more oil and gas. But the Oklahoma Geological Survey ties most of the manmade quakes in the state to wastewater disposal wells. Those wells, filled with pressurized byproducts of oil extraction, can set off an earthquake. Humans have been accidentally triggering quakes for decades. As the U.S. Department of Energy explains, oil production in California in the 1930s induced a series of earthquakes due to a kind of geologic collapse triggered by removing too much oil without balancing the pressure out with water. Modern water injection has a different purpose—to get rid of the millions of gallons of saltwater that gush up to the surface along with oil and gas. The water is not only useless because of its high salt content, it’s also expensive to get rid of. So oil producers simply inject it back into the earth again. That might not be an issue with small-scale oil production, but we’re talking a lot of water. “Ten, 20, I’ve even heard 50 barrels of water per barrel of oil,” says Boak. And then there’s Oklahoma’s unique geologic landscape. “In certain formations you can put it back down underground and use it to drive more oil into your producing wells, but [Oklahoma’s] wells are already wet,” Boak explains. So the water is injected into a deep zone known as the Arbuckle formation, which has become a kind of underground disposal area for the oil and gas industry. This layer of rock—Oklahoma’s deepest sedimentary layer—is beneath the area where oil and gas is extracted, so it has not been studied as much. What is known is that the porous rock takes up lots of water and has kept accepting water over the last half-century, so it’s become the layer of choice for oil companies with water to get rid of. Despite mounting evidence that wastewater disposal linked to oil and gas is causing the quakes, scientists still aren’t exactly sure what happens to the water once it gets into the Arbuckle. Does it drain into the basement rock beneath? Does something else happen to it? Do the faults causing the earthquakes even extend all the way down into the Arbuckle? It simply isn’t clear, says Boak. “We have no proof that there is a communication pathway down,” he admits. But something seems to be happening in the Arbuckle—and Boak’s organization currently thinks that faults are slowly pressurized with water, then spurred to seismic activity when pressure rises above a certain level. That pressure has translated into a veritable pressure cooker for Oklahoma residents, who have experienced property damage and the unsteady feeling of seemingly constant earthquakes since the seismic surge. Insurance rates have risen 300 percent or more since 2009. About 20 percent of Oklahomans now have earthquake insurance, but given that such insurance usually only covers catastrophic damage, it’s not much of a comfort. For Angela Spotts, enough was finally enough on October 10, 2015, when a 4.5 magnitude earthquake struck about 20 miles away from her home in Stillwater. “October 10 was truly a defining moment,” she tells Smithsonian.com. “[My husband and I] both looked at each other and went ‘wow, I don’t want to live like this anymore.’” Spotts, who spent years fighting both wastewater disposal and fracking in Oklahoma, says that the stress from ongoing quakes was a major factor in her decision to move to Colorado, where she now owns and operates a small hotel. She accuses the state of colluding with the oil and gas industry and dragging their feet on helping real Oklahomans deal with the new instability of the earth below. After years of inaction, Oklahoma is finally cracking down manmade quakes. The state’s oil and gas regulator, the Oklahoma Corporation Commission, avoided action on Arbuckle wells for years. But recently, it’s shown signs of finally taking the quake problem seriously—largely after earthquakes rattled the homes of elected officials. The Commission has released several response plans, has adopted a “traffic light” system for permitting disposal wells, adopted stricter monitoring and reporting rules and regulated how deep water can be injected. It took years of lawsuits and community organizing by people like Spotts to get the issue on the legislative radar. Chad Warmington, president of the Oklahoma Oil & Gas Association, tells Smithsonian.com that the oil and gas industry is working closely with regulators and geologists to help prevent manmade quakes. “I’m pretty pleased with the outcome,” he says. “We’ve made a very honest effort to really figure out what is going on and what we can do to impact the seismicity outbreak in the state.” He says that association members have borne the brunt of the regulatory cleanup, providing proprietary data to geologists and cutting back production. Indeed, some producers like SandRidge Energy, which fought hard against the restrictions, have since declared bankruptcy. While Boak says that earthquakes have dropped off since 2014, when the strictest regulations were introduced, he notes that much of the reduction was likely driven by declines in oil prices. But both agree that if oil prices rise again, producers will still be forced to dispose of less water, which will likely affect future quakes. After last weekend’s quake, 37 wells remain shut down by the state as a precautionary measure. But will the problem simply drift to another state as Oklahoma gets tougher on oil and gas wastewater disposal? We may soon find out: The U.S. Geological Survey has tied spikes in earthquakes in states like Kansas, Ohio, Texas and Arkansas to the practice and says that some seven million people live in a place that could experience a damaging, manmade earthquake this year. Unlike Oklahoma, Kansas has limited how much wastewater may be injected as opposed to how deep it may go. To truly cut the number of earthquakes created by humans, the answer may not lie in how much water is disposed of, but whether water is disposed of at all. You’ve no doubt by now been inundated with the threat of global sea level rise. At the current estimated rate of one-tenth of an inch each year, sea level rise could cause large swaths of cities like New York, Galveston and Norfolk to disappear underwater in the next 20 years. But a new study out in the Journal of Geophysical Research shows that in places like Juneau, Alaska, the opposite is happening: sea levels are dropping about half an inch every year. How could this be? The answer lies in a phenomenon of melting glaciers and seesawing weight across the earth called “glacial isostatic adjustment.” You may not know it, but the Last Ice Age is still quietly transforming the Earth’s surface and affecting everything from the length of our days to the topography of our countries. During the glacier heyday 19,000 years ago, known as the Last Glacial Maximum, the Earth groaned under the weight of heavy ice sheets thousands of feet thick, with names that defy pronunciation: the Laurentide Ice Sheet, the Cordilleran Ice Sheet, the Fennoscandian Ice Sheet, and many more. These enormous hunks of frozen water pressed down on the Earth’s surface, displacing crustal rock and causing malleable mantle substance underneath to deform and flow out, changing the Earth’s shape—the same way your bottom makes a depression on a couch if you sit on it long enough. Some estimates suggest that an ice sheet about half a mile thick could cause a depression 900 feet deep—about the of an 83-story building. The displaced mantle flows into areas surrounding the ice sheet, causing that land to rise up, the way stuffing inside a couch will bunch up around your weight. These areas, called “forebulges,” can be quite small, but can also reach more than 300 feet high. The Laurentide Ice Sheet, which weighed down most of Canada and the northern United States, for example, caused an uplift in the central to southern parts of the U.S. Elsewhere, ancient glaciers created forebulges around the Amazon delta area that are still visible today even though the ice melted long ago. As prehistoric ice sheets began to melt around 11,700 years ago, however, all this changed. The surface began to spring back, allowing more space for the mantle to flow back in. That caused land that had previously been weighed down, like Glacier Bay Park in Alaska and the Hudson Bay in Canada, to rise up. The most dramatic examples of uplift are found in places like Russia, Iceland and Scandinavia, where the largest ice sheets existed. In Sweden, for example, scientists have found that the rising land severed an ancient lake called Malaren from the sea, turning it into a freshwater lake. At the same time, places that were once forebulges are now sinking, since they are no longer being pushed up by nearby ice sheets. For example, as Scotland rebounds, England sinks approximately seven-tenths of an inch into the North Sea each year. Similarly, as Canada rebounds about four inches each decade, the eastern coast of the U.S. sinks at a rate of approximately three-tenths of an inch each year—more than half the rate of current global sea level rise. A study published in 2015 predicted that Washington, D.C. would drop by six or more inches in the next century due to forebulge collapse, which might put the nation’s monuments and military installations at risk. Some of the most dramatic uplift is found in Iceland. (Martin De Lusenet, Flickr CC BY). Recent estimates suggest that land in southeast Alaska is rising at a rate of 1.18 inches per year, a rate much faster than previously suspected. Residents already feel the dramatic impacts of this change. On the positive side, some families living on the coast have doubled or tripled their real estate: As coastal glaciers retreat and land once covered by ice undergoes isostatic rebound, lowland areas rise and create “new” land, which can be an unexpected boon for families living along the coast. One family was able to build a nine-hole golf course on land that has only recently popped out of the sea, a New York Times article reported in 2009. Scientists have also tracked the gravitational pull on Russell Island, Alaska, and discovered that it’s been weakening every year as the land moves farther from the Earth’s center. Uplift will increase the amount of rocky sediment in areas previously covered in water. For example, researchers predict that uplift will cause estuaries in the Alaskan town of Hoonah to dry up, which will increase the amount of red algae in the area, which in turn, could damage the fragile ecosystems there. In addition, some researchers worry that the rapid uplift in Alaska will also change the food ecosystem and livelihood for salmon fishers. Although not as visible, all the changes caused by glacier melt and shifting mantle is also causing dramatic changes to the Earth’s rotation and substances below the earth’s surface. As our gargantuan glaciers melted, the continents up north lost weight quickly, causing a rapid redistribution of weight. Recent research from NASA scientists show that this causes a phenomenon called “true polar wander” where the lopsided distribution of weight on the Earth causes the planet to tilt on its axis until it finds its balance. Our north and south poles are moving towards the landmasses that are shrinking the fastest as the Earth’s center of rotation shifts. Previously, the North Pole was drifting towards Canada; but since 2000, it’s been drifting towards the U.K. and Europe at about four inches per year. Scientists haven’t had to change the actual geographic location of the North Pole yet, but that could change in a few decades. Redistribution of mass is also slowing down the Earth’s rotation. In 2015, Harvard geophysicist Jerry Mitrovica published a study in Science Advances showing that glacial melt was causing ocean mass to pool around the Earth’s center, slowing down the Earth’s rotation. He likened the phenomenon to a spinning figure skater extending their arms to slow themselves down. Glacial melt may also be re-awakening dormant earthquakes and volcanoes. Large glaciers suppressed earthquakes, but according to a study published in 2008 in the journal Earth and Planetary Science Letters, as the Earth rebounds, the downward pressure on the plates is released and shaky pre-existing faults could reactivate. In Southeast Alaska, where uplift is most prevalent, the Pacific plate slides under the North American plate, causing a lot of strain. Researchers say that glaciers had previously quelled that strain, but the rebound is allowing those plates to grind up against each other again. “The burden of the glaciers was keeping smaller earthquakes from releasing tectonic stress,” says Erik Ivins, a geophysicist at NASA’s Jet Propulsion Laboratory. Melting glaciers may also make way for earthquakes in the middle of plates. One example of that phenomenon is the series of New Madrid earthquakes that rocked the Midwestern United States in the 1800s. While many earthquakes occur on fault lines where two separate plates slide on top of each other, scientists speculate that the earthquakes in the New Madrid area occurred at a place where hot, molten rock underneath the Earth’s crust once wanted to burst through, but was quelled by the weight of massive ice sheets. Now that the ice sheets have melted, however, the mantle is free to bubble up once again. Scientists have also found a link between deglaciation and outflows of magma from the Earth, although they’re not sure why one causes the other. In the past five years, Iceland has suffered three major volcanic eruptions, which is unusual for the area. Some studies suggest that the weight of the glaciers suppressed volcanic activity and the recent melting is 20-30 times more likely to trigger volcanic eruptions in places like Iceland and Greenland. Added on to all the unknowns, researchers also don’t know exactly how this prehistoric process will be affected by current patterns of global warming, which is accelerating glacial melt at an unprecedented rate. In Alaska, global warming means less snow in the wintertime, says Hood. And while the effects may vary from city to city—local sea levels may be rising or dropping—it’s clear that the effects are dramatic, wherever they may be. Although many of glaciers have long gone, it’s clear that the weight of their presence still lingers on the Earth, and on our lives. For the residents of Aogashima, an island about 200 miles due south of Tokyo, 1785 was an unforgettable year. Although they weren’t alive to witness the deadliest event in island history, they know what unfolded all too well—and what they know hasn’t changed their mind about living atop a real-life volcano. They’ve heard the stories about how, on May 18, the ground began to shake. Giant plumes of gas and smoke billowed out from the mouth of the island’s volcano, shooting rocks, mud and other debris into the sky. By June 4, the island’s 327 residents had no choice but to evacuate, but only about half succeeded and the rest perished. Those who live on the island that’s home to a volcano still registered as active by the Japanese Meteorological Agency, the governmental agency responsible for monitoring the nation’s 110 active volcanoes, know that there’s always the chance that history could repeat itself. But Aogashima’s inhabitants are willing to take that risk. One such resident is Masanubu Yoshida, a government worker who has lived on the island for the past 15 years. He says that he tries not to spend too much time worrying about the possibility of another eruption. After all, it’s been more than 230 years since the last one—the odds (at least so far) are in his favor. “No one can win over nature,” he tells Smithsonian.com. Rather than dwell on the possibilities, the 40-year-old focuses on the benefits of living in this lush paradise, which formed from the remnants of four overlapping calderas centuries ago. Much of the village is located inside the outer crater wall. Fishing is a popular pastime for many residents, as the island is situated in the middle of the Philippine Sea. Hiking, camping and swimming (although the island’s steep, rocky cliffs can make accessing the water a challenge anywhere outside the harbor) are also popular pursuits. “We’re also blessed with hot springs and geothermal energy because of the volcano,” he adds. According to one tourist, who wrote about a visit to one of the island’s natural saunas, you can bring food and cook it by placing it on top of one of the sauna’s steam vents. The sauna has a collection of pots and pans at the ready for boiling eggs and other snacks. Though Yoshida does hold an office job, many of his neighbors are farmers and fishermen. Besides acres of expansive greenery, the island is home to a shochu distillery—a liquor that is similar to vodka and is the national spirit of Japan—a salt manufacturer, several general stores, a bed and breakfast and an automobile repair factory. Despite the island’s small size, most of its residents travel by car rather than biking or walking—and for good reason. Aogashima has several roadways, with the majority zigzagging throughout the island’s center. But besides the handful of more urbane diversions on the island, Aogashima stands in stark contrast to life on Japan’s mainland. Because of his work, Yoshida says that he makes multiple visits to Tokyo each year, utilizing a ferry that makes the 200-mile journey across the sea. Another option is traveling by helicopter. However, the crush he feels being just a speck amongst Tokyo’s some 13.4 million residents is enough for him to crave the solitude he experiences back home on the island. Fortunately for Yoshida and his neighbors, so far the volcano remains quiet. The Japan Meteorological Agency, which began issuing alerts in 2007, tells Smithsonian.com that no volcanic warning has been issued for Aogashima in those nine years. Every new day is another one in paradise for islanders—at least for now. Everything is reflective and everything’s white,” recalls filmmaker Alex Cornell, who vacationed there last month with his family. “People had said that the first time you go, you’re kind of so overwhelmed that you take a lot of pictures of your feet and you don’t really know what’s going on … I definitely felt that,” he says with a laugh. But as they approached the mass, which rose about 30 feet out the water, Cornell understood his guide’s excitement. Whereas most iceberg tips are covered in snow or have been weathered by the elements, this one was free of debris, exposing glassy, aqua-green ice with water flowing through it—“almost like an ant colony,” he says. Cornell’s guide suggested that the iceberg had recently flipped. Icebergs form when chunks of freshwater ice calve—or break off—from glaciers and ice shelves, as well as other icebergs. Because of the varying densities of ice and saltwater, only about 10 percent of an iceberg will ever show at the surface, and that protruding tip will gather dirt and snow. Melting can trigger calving, but it can also change the equilibrium of an iceberg, causing it to flip. In the case of this jewel-like iceberg, the ice is probably very old. In glaciers, years of compression force out air pockets and gradually make the ice denser, according to the National Snow and Ice Data Center. “When glacier ice becomes extremely dense, the ice absorbs a small amount of red light, leaving a bluish tint in the reflected light, which is what we see.” In addition, minerals and organic matter may have seeped into the underwater part of the iceberg over time, creating its vivid green-blue color. Justin Burton, an assistant professor at Emory University who has studied the physics of flipping icebergs, says that the phenomenon is occurring more frequently now due to climate change. Outlet glaciers are rivers of ice that flow outward from an ice cap or ice sheet and into the sea. According to Burton, outlet glaciers have been retreating in Antarctica and Greenland, and this contributes to iceberg flipping. Burton is able to remotely record seismic signals and interpret when they’re caused by large icebergs flipping. But he says that it is difficult to properly estimate how often a flip happens due to the need for visual confirmation and the dangers and expense of setting up recording equipment. For more of Cornell’s photos and video work, visit his portfolio here. In the last few years, DNA analysis has allowed researchers to redraw the tree of life in incredible detail, but there’s always been a question mark at the base of the tree. While it’s unlikely that researchers will ever find the exact species that started it all, they recently came up with a pretty good description of LUCA, the Last Universal Common Ancestor of all of Earth’s creatures, sometimes referred to as microbial Eve. Life as we know it is currently divided into six kingdoms: plants, animals, fungus, protists, eubacteria and archaebacteria. The first four belong to the a domain known as eukaryotes, sporting cells with distinct nuclei. The other two kingdoms, eubacteria and archaebacteria are single-celled organisms without a distinct nucleus. All of them evolved from a single-celled ancestor that lived about 4 billion years ago when Earth was celestial baby. After all those billions of years of change, LUCA’s fingerprints are still visible in the genes of modern organisms. That’s why William Martin, an evolutionary biologist at Heinrich Heine University in Düsseldorf, Germany, set out to study LUCA’s trail in the genes of bacteria and archaea, the two groups researchers believe became eukaryotes. Tracking genes in bacteria is particularly difficult because they can swap genetic material, making it hard to discern whether the single-celled organisms received a gene from an ancestor or picked it up from another species along the evolutionary road, reports Robert F. Service at Science. So Martin and his team decided to search for genes shared by at least two species of modern bacteria and two archaea, an indicator that the gene was likely inherited and not an evolutionary hitchhiker. The researchers combed through DNA databanks, analyzing the genomes of 2,000 modern microbes sequenced over the last two decades. From six million total genes, they found 355 gene families that were widespread among the microbes, which means they were likely to be genes LUCA passed down. They published their results in Nature Microbiology. LUCA’s genes are those of an extremophile organism that likely lived in an area where seawater and magma meet on the ocean floor, known as hydrothermal vents, reports Nicholas Wade at The New York Times. Similar creatures still haunt these environments among the toxic plumes of sulfides and metals. And many researchers already believe this is where life first began. But not everyone is convinced that the hydrogen gobbling vent-dweller Martin uncovered is really LUCA. John Sutherland of the University of Cambridge in England, whose research suggests the origins of life began on land and not deep in the ocean, tells Wade that life could have developed elsewhere and then been shoved down into places like hydrothermal vents during global disasters like the Late Heavy Bombardment, a catastrophic period in Earth’s history between 4 billion and 3.8 billion years ago in which the planet was reshaped by a shower of asteroids and comets. In fact, he argues that basic chemistry shows life likely originated in pools of water on land, Darwin’s “warm little ponds.” Ultraviolet light from the sun, which does not reach down to hydrothermal vents, he argues, is a key element in that chemistry. More research is necessary for scientists to unravel the twisting branches of the tree of life and to determine if Martin’s LUCA is a super-great aunt or the microbial Eve. The great mysteries of the universe often revolve around distant, invisible phenomena. Scientists puzzle over inexplicable bursts of radio waves, the elusive nature of gravity and whether dark energy pervades the cosmos. But other enigmas can be found in our own corner of the galaxy, staring us right in the face—like how Earth became the planet it is today. That’s a bit surprising, given that Earth is by far the best-studied planet in the universe. But geologic processes like plate tectonics constantly recycle evidence of the past, and much of the critical information about Earth’s makeup lies hidden in its vast, inaccessible depths. “You are trying to understand a planet that you can only sample at the surface,” says James Badro, a geophysicist at the Institute of Earth Physics in Paris. Although scientists have gleaned a wealth of knowledge from studying the ground beneath our feet, the full story of Earth’s construction and evolution remains unknown. So researchers have turned to the skies for help. They have studied other star systems looking for clues, and searched for the building blocks of Earth among the detritus of the solar system. Now, a suite of planned and proposed space missions could help scientists fill in more of the missing pieces. From studying new aspects of protoplanetary bodies to sleuthing out where they came from and how they got mixed together, researchers hope to pin down the processes of planetary formation that created Earth. For many, it’s as much a philosophical quest as a scientific one. “It’s a question of our origins,” Badro says. Most researchers now agree on the general history of our solar system. It began 4.6 billion years ago, when a vast cloud of gas and dust floating in space collapsed onto itself, perhaps triggered by the shock wave of a nearby supernova. The flattened cloud then swirled into a spinning disk from which—about 100 million years later—our solar system emerged in more or less its current state: the sun surrounded by eight planets and innumerable smaller bodies scattered throughout. The finer details of how our cosmic neighborhood formed, however, remain contentious. For instance, scientists still debate what the planets are made of. “We know what the cake looks like,” says Lindy Elkins-Tanton of Arizona State University, “but we would like to know what all those individual ingredients look like too,” she says. Scientists think that the terrestrial planets grew by gobbling up smaller planetesimals—objects up to tens of miles in diameter that accumulated from protoplanetary dust. But the composition and structure of those planetesimals has been hard to determine. Studying our collection of meteorites—fragments of asteroids that have fallen to Earth—is a good place to start, says Francis Nimmo, a planetary scientist at the University of California, Santa Cruz. But it’s not enough. That’s because we don’t necessarily have samples of everything that went into the planets—some components may be missing or may no longer exist at all. Some meteorites do appear to be a decent match for Earth, but scientists cannot come up with any combination of meteorite types that fully explains Earth’s chemical composition. “This is kind of uncomfortable because it means that we don’t really know how the Earth was put together,” Nimmo says. Elkins-Tanton hopes that a proposed future mission—one of five finalists for NASA’s Discovery program—might be able to help. The project, led by Elkins-Tanton, would send an unmanned spacecraft to visit an object called Psyche, which sits in the asteroid belt between Mars and Jupiter. Psyche is roughly 150 miles wide and, based on remote observations of its density and surface composition, appears to be made of solid metal. It may also resemble the building blocks of Earth. “This could be the little core of a body that was formed in the terrestrial planet-forming region and just got hit by a lot of other things and had its rocky exterior stripped away,” Elkins-Tanton says. On NASA’s Dawn mission, scientists studied the asteroid Vesta, a protoplanet that also probably formed near Earth and then got kicked out into the asteroid belt. However, it’s the unique opportunity to see what lies beneath the surface of objects like Vesta that has Elkins-Tanton excited. “Psyche is the only body in the solar system that allows us to directly observe a metal core,” she says. “This could be our only chance of looking at this kind of ingredient.” Along with the other Discovery finalists, Elkins-Tanton and her colleagues will find out in September if the mission is a go. According to the classical model of planetary formation, once planetesimals reached Psyche’s size—tens to hundreds of miles across—they started to cannibalize their neighbors, says Kevin Walsh, a planetary scientist at the Southwest Research Institute in Boulder, Colorado. “The biggest ones grow really fast,” he says, thanks to their increasing gravitational influence. This process of runaway accretion would have winnowed the number of bodies in the solar system to perhaps a hundred moon- to Mars-sized planetary embryos and a smattering of smaller debris. Over time, these embryos slowly combined to form planets. But while this explanation works well for the terrestrial planets, which geologic evidence suggests formed over the course of 30 to 100 million years, it presents a problem for the gas giants like Jupiter. Scientists think the cores of these bodies had to grow much more quickly—fast enough to capture their massive atmospheres from the gas present in the early solar system, which dissipated in just a few million years. Over the last decade, researchers have developed an alternative mechanism for growing planets known as pebble accretion. It represents a stark departure from the conventional model of accretion, in which objects combined to form progressively larger particles. Or, as Hal Levison, Walsh’s colleague, puts it: “Pebbles make boulders, and boulders make mountains—all the way up.” Pebble accretion, on the other hand, predicts that objects grow from fist-sized lumps to Pluto-sized bodies almost immediately, and then continue to gain mass, says Levison, who helped develop the hypothesis. The process would have begun shortly after the formation of the protoplanetary disk, when bits of dust circling orbiting the young sun began to collide and stick together, like synchronized skaters joining hands while circling an ice rink. Eventually, aerodynamic and gravitational forces would have pulled large clusters of these pebbles together, forming planetesimals. The planetesimals then continued to sweep up the remaining pebbles around them, rapidly growing until they formed planets. On top of addressing the question of how gas giants grew so fast, the model also provides a way to overcome something called the meter-size barrier, which has plagued models of planetary accretion since it was first outlined in the 1970s. It refers to the fact that once objects reach about three feet in diameter, friction generated by the surrounding gas would have sent them spiraling into the sun. Pebble accretion helps hurtle small particles over the threshold, making them big enough to hold their own. Scientists are still trying to understand whether this process happened throughout the entire solar system, and whether it would have played out the same way for the inner and outer planets. (While it works for the gas giants, the later stages of rapid growth don’t fit with what we know about terrestrial planet formation). But researchers may find some clues later this year, when NASA’s Juno mission, which successfully reached Jupiter last month, begins gathering information about the planet’s composition and core. Walsh says figuring out how much material lies at the center of the gas giant will help researchers constrain different models of planetary accretion. If Jupiter has a small core, classical accretion might have been able to build it up fast enough; if it’s big, it might imply that something like pebble accretion took place instead, he says. Understanding how Jupiter formed will also help researchers understand the origins of the other planets, including Earth. That’s because Jupiter has been accused of meddling with the construction of the inner rocky planets, at least according to a new idea developed by Walsh and others that’s gained traction in recent years. The hypothesis, known as the Grand Tack model, suggests that as Jupiter finished forming, it would have cleared out all the material in its path around the sun, effectively carving a gap in the protoplanetary disk. The disk, however, still contained plenty of gas and dust, which pressed in toward the sun as the disk flattened and stretched, Walsh says. Jupiter’s gap effectively blocked the flow of this material, and the planet got “caught in the floodwaters,” Walsh says. It migrated in to about Mars’ orbit with Saturn close on its heels. But as Saturn followed, it trailed enough material to reconnect the disk. This released the pressure pushing on Jupiter, allowing both planets to migrate back out again, all in the space of a few hundred thousand years. The model was inspired by observations of oddly ordered planets in other solar systems that suggest such migrations are common, Walsh says. For the rest of the solar system, this would have been something like a pair of bulls in a cosmic china shop. Bits of debris from the inner solar system would have gotten kicked out while clutter from the outer system would have gotten dragged in, Walsh says. The model helps explain Mars’ runt-size dimensions and the number and diversity of bodies found today in the asteroid belt. It also provides a possible explanation for how the terrestrial planets got their water. According to Grand Tack, the gas planet migration would have taken place while the terrestrial planets were still forming, and could have tossed water-rich material from the outer solar system into the mix. Walsh and many other scientists think that carbonaceous asteroids, which may have formed beyond Jupiter, were the main vehicles for delivering water to Earth. This September, NASA will launch a mission to visit one such asteroid named Bennu. Walsh is a co-investigator on the project, called OSIRIS-REx, which will study the body from afar before grabbing a sample to bring back to Earth. A similar mission by the Japanese space agency, called Hayabusa 2, is on track to sample another carbonaceous asteroid in 2018. Scientists hope to learn more about where these asteroids came from, and whether they are indeed the source of a class of meteorites known as carbonaceous chondrites. They also hope that studying a pristine sample—rather than a meteorite fragment—will help reveal whether these objects delivered not only water to Earth, but the organic compounds that may have served as the precursors for life. 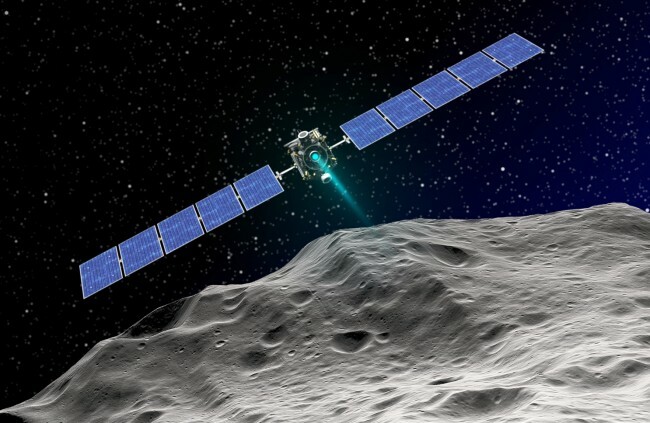 As OSIRIS-REx is returning to Earth, it could cross paths with Lucy, another proposed mission that, like Psyche, is a finalist in the Discovery program. Led by Levison, Lucy aims to explore the last major shake-up that rocked our solar system—a planetary tango that began about 500 million years after the Grand Tack. That’s when, according to a hypothesis by Levison and others, Pluto triggered an instability that caused Neptune to hopscotch outside of Uranus and the outer gas giants to migrate away from the sun to their present positions. This disturbance, known as the Nice model, would have sent a rain of debris hurtling into the inner solar system, possibly explaining a cluster of impacts formed during a period known as the Late Heavy Bombardment. The terrestrial planets, like Earth, had mostly formed by this point, so the event didn’t significantly affect their composition. But it may have thrown a curveball at scientists trying to understand how the solar system evolved. The disruption might have flung objects into the inner solar system that had no connection to the materials that make up the bulk of the terrestrial planets, Walsh says. Lucy could help scientists figure out what really happened and allow them to disentangle what got mixed where. It would accomplish this by investigating a group of asteroids locked into Jupiter’s orbit. These objects, known as the Jovian Trojans, are a mixture of bodies that formed throughout the outer solar system and then got thrown together during the migration. Levison says studying the Trojans up close will give researchers a clearer idea of how the Nice model mixing occurred, and could also provide a test of pebble accretion. The hypothesis predicts that anything smaller than about 60 miles across should actually be a fragment of a larger body. It’s a prediction Lucy should be able to test. Together, these missions appear poised to further scientists’ understanding of Earth’s origins, probably in ways researchers can’t even imagine yet. After all, building a robust picture of planetary formation requires combining data from many different sources, says David Stevenson, a planetary scientist at Caltech. Indeed, the hellish conditions on Venus’s surface have stymied efforts to study the planet in detail. Russia managed to land a series of spacecraft on the surface between the 1960s and 80s. They only survived for a few hours and transmitted brief flashes of data before succumbing to the heat. But these and other missions, like NASA’s Pioneer and Magellan, which studied the planet from afar, did provide glimpses into the planet’s workings. We know, for instance, that Venus has an intense greenhouse atmosphere made almost entirely of carbon dioxide and that it seems to have lost most of its surface water. This may be what prevents plate tectonics from occurring there — water is thought to grease the wheels of subducting plates. It may also explain why Venus lacks a geomagnetic field, which many scientists consider a necessity for life because it shields the planet from the ravages of the solar wind. Geomagnetic fields are produced by convection in the core of a body, Nimmo says, and rely on mantle circulation — often tied to plate tectonics — to transport heat away. What scientists want more than anything are samples of Venus’ surface rocks, but that remains a distant goal. For the foreseeable future, researchers will have to settle for more remote observations, like those from a current Japanese mission. Earlier this year, the Akatsuki spacecraft finally began relaying data from its orbit around Venus after an unplanned five-year detour around the sun. In addition, NASA is considering two more Venus-centered missions of its own that are also Discovery finalists. One project, called VERITAS, is led by Smrekar and would involve an orbiter capable of studying the planet’s geology in high definition. The second proposed mission, led by Lori Glaze of the Goddard Space Flight Center, would analyze Venus’ unique atmosphere using a probe called DAVINCI. The hope is that these efforts will reveal why Venus evolved the way it did, and thus, what makes Earth different. At the moment, many researchers think Earth and Venus probably formed from roughly the same material then diverged over time thanks to several factors. These include their differing proximity to the sun, and the fact that Earth experienced a major collision relatively late in its history—the impact that formed the moon—which would have re-melted much of the planet and potentially altered its dynamics. Not long ago, a precious packet of blood traveled more than 7,000 miles by special courier, from America to Australia, to save the life of a newborn. Months before the delivery date, a routine checkup of the mom-to-be had revealed that the fetus suffered from hemolytic disease. Doctors knew that the baby would need a blood transfusion immediately after delivery. The problem was, the baby’s blood type was so rare that there wasn’t a single compatible donor in all of Australia. A request for compatible blood was sent first to England, where a global database search identified a potential donor in the United States. From there, the request was forwarded to the American Rare Donor Program, directed by Sandra Nance. The ARDP had compatible frozen blood on hand, but Nance knew that a frozen bag might rupture in transit. So her organization reached out to the compatible donor, collected half a liter of fresh blood, and shipped it across the Pacific. When the mother came in to give birth, the blood was waiting. “It was just magic,” Nance says. You’re probably aware of eight basic blood types: A, AB, B and O, each of which can be “positive” or “negative.” They’re the most important, because a patient who receives ABO +/– incompatible blood very often experiences a dangerous immune reaction. For the sake of simplicity, these are the types that organizations like the Red Cross usually talk about. But this system turns out to be a big oversimplification. Each of these eight types of blood can be subdivided into many distinct varieties. There are millions in all, each classified according to the little markers called antigens that coat the surface of red blood cells. AB blood contains A and B antigens, while O blood doesn’t contain either; “positive” blood contains the Rhesus D antigen, while “negative” blood lacks it. Patients shouldn’t receive antigens that their own blood lacks—otherwise their immune system may recognize the blood as foreign and develop antibodies to attack it. That’s why medical professionals pay attention to blood types in the first place, and why compatible blood was so important for the baby in Australia. There are in fact hundreds of antigens that fall into 33 recognized antigen systems, many of which can cause dangerous reactions during transfusion. One person’s blood can contain a long list of antigens, which means that a fully specified blood type has to be written out antigen by antigen—for example, O, r”r”, K:–1, Jk(b-). Try fitting that into that little space on your Red Cross card. Rutgers professor, David S. Goodsell, was featured on the Smithsonian website for his watercolor and ink depictions of what it might look like when the Zika virus infects a cell. Zika virus exploded onto the global stage last year when health officials began to suspect it could cause birth defects in babies. Like the Ebola epidemic in 2014, fear burgeoned quickly. The destruction wrought by the disease is profoundly unsettling, in part because the particles of contagion are invisible. To make something visible is to get a better handle on it, to make it more manageable. In March of this year, Michael Rossmann of Purdue University in Indiana and his colleagues mapped what Meghan Rosen for Science News described as the “bumpy, golf ball-shaped structure” of Zika. With the structure deduced, scientists now have a starting point to learn how the virus works and whether it can be stopped. Researchers will look for points in the structure that might offer up a target for a drug. In that vein, but with a more artistic twist, another scientist has painted an image of what it might look like when Zika infects a cell. David S. Goodsell’s watercolor depicts an area about 110 nanometers wide, reports Maggie Zackowitz for NPR. That’s almost 1,000 times smaller than the width of a typical human hair. In the painting, a pink sphere representing the virus has been sliced in half to reveal tangles of the viral genetic material. Fleshy protuberances on the virus’s surface grasp green towers embedded in a light green curve that seems to enclose a jumble of blue. The surface proteins of the virus are binding to receptors on the surface of a cell it will soon infect. Deadly viruses never looked so beautiful as they do under Goodsell’s brush. The molecular biologist with joint appointments at the Scripps Research Institute in La Jolla, California and Rutgers State University in New Jersey paints brightly colored and squishy-looking shapes resembling jellybeans, footballs and spaghetti that crowd and jumble together. As abstract images they are delightful, but Goodsell’s work is also firmly footed in science. The scientist-artist makes some educated guesses for his paintings. “Some of the objects and interactions are very well studied and others are not,” he explains. “The science is still a growing field.” But his expertise lets him wield the paintbrush with confidence. Visualizing the microscopic biological world first intrigued Goodsell in graduate school, when he relied on techniques such as x-ray crystallography to deduce the folds, twists and contortions of proteins and nucleic acids. Structure is key to giving molecules in cells their function, whether they are enzymes that cleave other molecules, RNA strands that instruct protein building or the fibers that support and shape tissues. Pockets in proteins offer up spots where other molecules can bind and catalyze or prevent reactions. When Rosalind Franklin succeeded in capturing the first picture of DNA, using x-ray crystallography, James Watson and Francis Crick were quickly able to deduce how unzipping the double helix could provide a template for replication of genetic material. “If you are standing outside an automobile and the hood is closed so you can’t see the engine, you have no idea how the machine works,” says Stephen K. Burley, a researcher who studies proteomics at Rutgers University. Cells themselves are tiny, complex machines, and understanding how they work or what parts and processes go awry under the influence of disease, requires a look under the hood. That’s why Goodsell needed to understand how molecules were shaped as well as how they fit together inside the cell. Computer graphics were just breaking into the research lab scene in the mid-1980s and giving scientists like Goodsell, now 55, an unprecedented look at the molecules they studied. But even the best programs struggled to show all the intricacies of a single molecule. “Objects the size of a protein were a real challenge,” he says. Visualizing multiple proteins and their place relative to cellular structures was beyond the hardware and software capabilities at the time. “I said to myself: What would it look like if we could blow up a portion of the cell and see the molecules?” Goodsell says. Without the high-powered computer graphic capabilities of today, he turned, quite literally, to the drawing board to piece together all the bits of knowledge about structure he could and create that image of the crowded interior of a cell. His goal was “to get back to looking at the big picture of science,” he says. The images he creates are meant to be scientific illustrations, to inspire researchers and the general public to think about the structures that underlay chemical reactions and cells’ functions. Typically, Goodsell spends a few hours digging through scientific literature to learn everything researchers know about the topic he wants to illustrate. Then, he draws up a big pencil sketch based on what he has learned. Carbon paper helps him transfer that sketch to watercolor paper. The molecules inside cells are often smaller than the wavelength of light, so a true view of a molecular landscape would be colorless, but Goodsell adds color and shading to help people interpret his paintings. The result is detailed views of molecular machinery at work. In an Ebola painting, for example, the virus looks like a huge worm rearing its head. The virus has stolen the components of a cell membrane from an infected cell, depicted in light purple, Goodsell writes for the online resource, the RCSB’s Protein Data Bank (PDB). Turquoise broccoli-heads stuccoing the outside of that membrane are glycoproteins, which can latch on to the surface of a host cell and pull the viral particle close enough that its genetic material (in yellow, protected by the green nucleoprotein) can be shoved inside. Those glycoproteins have been a major target for drugs to combat the virus. The painting won this year’s Wellcome Image Awards, a competition that draws experts in scientific illustration and visualization from the around the world. The Ebola painting and many other images by Goodsell live at the PDB, under the supervision of Burley, the repository’s director. The PDB holds more than 119,000 structures of proteins, RNA, DNA and other molecules. A few statistics demonstrate how important structure is for biologists: There are about 1.5 million downloads of detailed 3D structural information from the data bank every day. In the last four years, people from 191 of the 194 recognized independent states in the world have accessed the resource. In July, Goodsell will post his 200th “Molecule of the Month,” a series featuring his depictions of proteins and other molecules along with a written explanation of the structures’ function and importance. Goodsell’s work helps to educate high school students and others about the structures behind disease-causing particles and health conditions in the news. For the so-called PDB-101 series, his molecules help students better understand the mechanisms behind type 2 diabetes or lead poisoning. He has an upcoming large-scale painting that will cover the life cycle of the HIV virus. Even the experts can learn from Goodsell’s illustrations. Early on, he recalls going around the institute to ask his colleagues how crowded they thought a cell was. The estimates he got back were very dilute. Only when he pulled back to look at the big picture did it become obvious that cells are very dense and complex. Goodsell’s work can be seen at the RCSB Protein Data Bank’s “Molecule of the Month” series and on his website. His website also provides more detail about some of the images in this article. The Rutgers WordPress entry is here .